It is tomato season and I am obsessed. I could eat a BLT for almost every meal. My secret to a great BLT is adding avocado (we call it a BALT in our house). With that in mind, I decided to switch it up and turn my favorite flavors into an egg salad. So egg salad…typically, not my thing. I dislike the mayo-based dressing and the consistency. I tried an avocado-based egg salad back at Easter time with some leftover Easter eggs and it turned my thoughts on the dish. 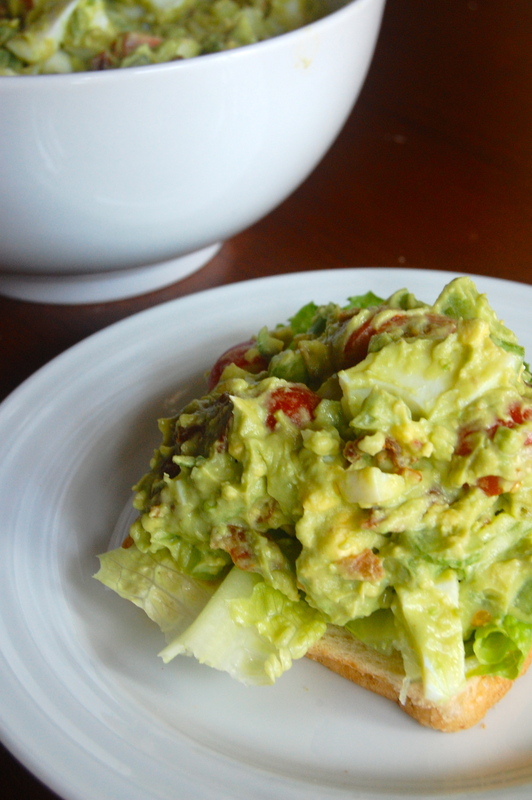 This Avocado BLT Egg Salad has all the components that I love. The salty and savory bacon, the juicy tomatoes (even better from your own garden!) and the creamy avocado come together for one delicious little salad. To hard boil eggs, place eggs in water in a medium saucepan. Bring water to a slow boil at medium-high heat. Once the water has reached a boil, set a timer for 10 minutes. After 10 minutes, remove the eggs and rinse under cool water. Cool a bit, then tap around all edges to crack. Peel and discard shells. Chop and place into mixing bowl. Add crumbled bacon, celery, and cherry tomatoes to chopped eggs and mix. In a separate bowl, mash avocados with a fork until smooth. Add Greek yogurt and a dash of salt and pepper. Stir until smooth. Add avocado mixture to egg mixture and stir until coated. This salad is great served open-faced on toasted bed and a few pieces of Romaine lettuce. It would also work great in a wrap or on an English muffin. This combines so many of our favorite things – avocado toast, bacon, and eggs. Delightful. Thanks for sharing! I’d really like to have this for lunch! Like as in today, right now! 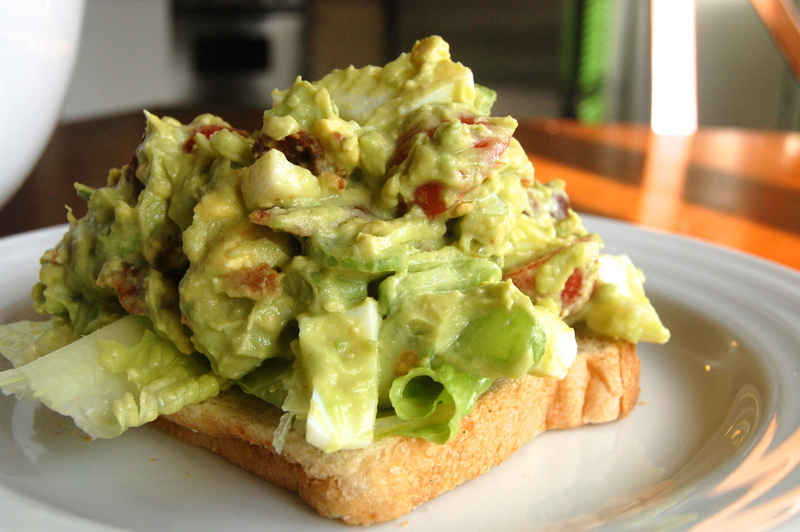 Clever twist on an egg salad recipe, the avocado and bacon takes it from ordinary to outstanding!